According to developer.android.com, the Android supports the playing of video using the H.263, H.264 AVC, MPEG4 SP and VP8 codecs. However, I want to play a video encoded in the .mxf format (Material eXchange format) in my Android phone. How do I go about it? Tips: MXF generally contains MPEG-2 / AVC video with profile/levels not supported by the decoders in the android devices. Specifically IMX is 422 profile at main level and HD MPEG-2 MXF is generally 422 profile at high level. There are some free MXF video player apps that you can download to your Android phone or tablet. Such as MX Player, VLC Media Player, GOM Media Player, KM Player, etc. 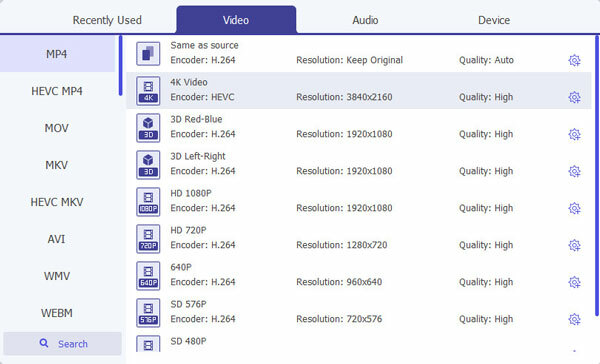 You can play MXF files from Sony/Canon/Panasonic P2 camcorders with those free MXF players app. If you don’t want to install above listed free MXF players on your Android phone/tablets or the free players listed above fail to do the MXF conversion work for you, you can convert MXF files to Android phone/tablets playable formats. To get the job easily completed, here, we would like to recommend you to download MXF Video Converter for Windows/Mac (support Mac OS X El Capitan) , which not only helps to convert Sony/Canon/Panasonic MXF files to Android device supported AVI, WMV, MP4, etc formats, but also enables you to directly output Android phone/tablets preset profile formats. How to Convert and Play Sony/Canon/Panasonic MXF Files on Android Phone/Tablets? Step 1: Load MXF files to the MXF Video Converter. Start the program on your computer, click “File” menu and select “Add Video/Audio” or “Add from folder” to import MXF videos to the application. Step 2: Output Android phone/tablet preset profile format. Click the Format bar, you can choose to select your android phone in main category,like:Samsung, Huawei,Sony, LG,xiaomi,HTC,Black Berry,Motorola. This format will be compatible with all Android phones and tablets. You can also opt to output specific device preset formats according to the Android device model that you own. Step 3: Adjust output aspect ratio to fit with Android phone/tablet. Open “Video Editor” window, under “Crop” tab, click “Advanced Mode” in the right panel, then select “Keep Ratio” option in the left panel, from “Display aspect ratio” drop-down list, you can either keep the original aspect ratio by choosing “Original” or keep the cropped aspect ratio such as 16:10, 16:9, 5:4, 4:3, 3:2, 2:1, etc from the aspect ratio lists. Step 4: Convert MXF to Android phone/tablets. After all the settings is completed, clicking the right-bottom “Convert” button on the main interface to start MXF to Android phone or tablets conversion. When the conversion is completed, you will get no problem to transfer and play converted files on Android phones or tablets. How to Convert and Play MXF on iPad mini/iPad 3/iPad 4/iPad 2?